First, I want to say that I really, really appreciate all of the effort that went into your class/spec-guides for 5.x. No one else has provided a resource nearly so useful -- even now, weeks after launch. It is a major coup for Icy-Veins, which I hadn't known about until 5.x I'm sorry to say. Given the information at Icy-Veins, I have endeavoured to obtain a large amount of crit-gear. However, I am concerned now, given all of the confusion on stats. And, as my raid team will be hitting its first MoP raid tonight, I'm hoping to clear the matter up ASAP. That's 2:1 vs. Icy-Veins.com, and please forgive me but I'm now feeling a little irritated that I trusted you guys on what gear to get and what stats to reforge to. I had been feeling as if my DPS was not up to par, and now I am going to have to do a great deal of work (and switch out a lot of gear) in order to be properly prepared for the raid. We are currently harmonizing our stat priorities with Ask Mr. Robot. This is a long process, as checking stat priorities is not as easy as it may appear. We will make an announcement when we are done. 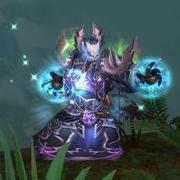 For DPS classes, we only have Shadow Priest, Elemental/Enhancement Shamans, and Arms/Fury Warriors left. Just make sure you get 8085 Haste rating... Remember, our dots aren't a fixed duration. Haste has a profound effect on our DPS. After that, Damian's correct in that the secondaries become very close to each other, so reforging for haste or crit are both good choices. Under 8085, haste is king. So haste, haste, haste, haste! To add to what Stasis said, you probably won't be able to reach that haste cap before Heroic gear. With T14 Normal gear, your stat budget for Critical Strike Rating, Haste Rating, and Mastery Rating will probably be around 10,000, making it hard to have more than 8,000 in a given stat. I was able to reach it in pre-raid gear. Required VP and the crafted 476 pieces, and the freebie boots from the Sha of Anger quest. Gemming for Haste obviously. Haste was weighted at 0.78, so more valuable than the Int gem hybrids anyway. With 8111 haste my weightings are now, Crit: 0.32 Haste: 0.31 Mastery: 0.28. And will likely stay similar for the rest of the tier. My DPS is certainly competitive with the top WoL parses. By the way, could you please check whether you get an 8th tick of Shadow Word: Pain at 8085 Haste Rating or at 8106 Haste Rating? Unfortunately, I don't have a priest to test it. I reforged/switched gear to get close enough to either side of the 8085 breakpoint. And either side of your 8106 rating. The mastery dot duplication messes up counting individual ticks, but the overall duration shows the breakpoint clearly enough. 8111 Haste is 19.19 seconds. The beauty of the breakpoint is obvious, the dots are ticking just as quickly but for 2.5 seconds longer; so fewer GCD's spent refreshing it, so can squeeze in extra Mind Flay ticks over the course of the fight. Haste is definitely a spriests go to stat until you hit 8085, or 7584 as a goblin. Reforge for it, gem for it until you get there. I assume at some later tier the second Vampiric Touch tick will also be feasible to reach, and will then become your new target, but for now SWP+2 is what you're looking for. Aye, but you don't want to gem exclusively for haste. You want to get there with some decent intellect as well. It's very possible to reach that point with a bit of MSV gear, and then start stacking your crit. As is now, I am the top DPS (or a close second, in some fights) in every group I run with.